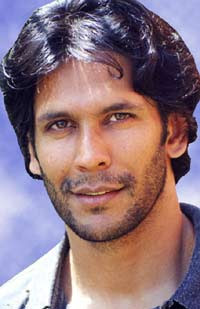 Milind Soman, the super model turned Bollywood actor is the new villain of Tamil cinema. He is going to play the bad man once again in a Tamil film. Two years back, he made a big impact as the villain in Pachakili Muthucharam, with the director Gautham Menon himself dubbing for him. Now he is back playing a negative role in Seventh Channel Narayanan’s Parthipan-Poorna starrer Vithagan. The film written and directed by Parthipan has him playing a cop, and Milind is an elusive don who controls Chennai. Vithagan, is being made as a stylish entertainer something similar to the producer's earlier film Vettayadu Vilayadu. The film has camera by M.S Prabhu, the hottest cinematographer in town after his Ayan became a hit. The music is by Joshua Sridhar. Milind is also the villain in Lingusamy's Karthi starrer Paiyya.